Steven Gerrard's corner was headed goalwards by Daniel Agger and Sturridge, on his 24th birthday, diverted it past two United shirts on the line. New Red Devils boss David Moyes' poor form at the home of the Reds continued, after failing to win in his previous 12 matches with Everton. Sturridge gave Liverpool the lead after just 4 minutes when the in-form striker managed to flick home Daniel Agger’s header from a corner. Manchester United had a penalty claim turned down after 16 minutes when Glenn Johnson handled the ball, following a slide tackle on RVP, but a spot-kick decision would have been harsh. Phil Jones was replaced by Antonio Valencia in the 37th minute, raising further problems on to Roy Hodgson’s side to face Moldova on Friday, following news earlier in the day that striker Wayne Rooney would sit out the encounter. An engrossing encounter at Anfield saw the home side control the first half, although they failed to produce any other clear-cut chances and ended the first period with only a single goal separating them. Manchester United started the second half in better fashion and were almost level when Ashley Young's excellent volley was deflected just wide of the post in the 49th minute. 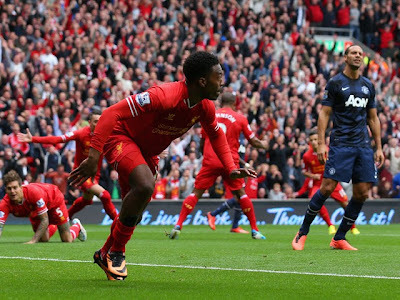 Danny Welbeck wanted a penalty when he was bundled over by Jose Enrique in the 54th minute, but nothing was given, and replays showed the Red Devils striker clearly diving. David Moyes' need for an attacking midfielder in the transfer window was highlighted by a lack of creativity in the centre of the park, and the away side struggled to break down Liverpool's resolute defence. Despite having the majority of possession in the second half United had just one Robin van Persie chance, which was saved by Mignolet, and the match fizzled out into a relatively easy win for Brendan Rodgers' side.